The 3D & 4D Technology market is expected to be worth USD 127.84 Billion in 2016 and grow at CAGR of 16.17% between 2016 and 2022. The base year for analysis is taken as 2015 and the forecasted period between 2016 and 2022. The market is segmented on the basis of technology, end-users industry, and geography. The demand in the entertainment industry is expected to drive the market growth in all regions– North America, Europe, APAC, and RoW. The North American market is expected to hold the largest share in 2016 and Asia-Pacific region is expected to grow at a highest CAGR between 2016 and 2022. The 3D applications technology is expected to drive the market due to its wide application usage among all the end-user industries. Among 3D applications, 3D gaming is expected to lead, in terms of market share, in 2016. The total market for 3D & 4D Technology is expected to reach USD 314.17 Billion by 2022, at a CAGR of 16.17% between 2016 and 2022. The major drivers for the growth of 3D content is the entertainment & animation industry and the growing CAD-based manufacturing of individualized custom parts and components. Out of the major end-user industries, the market for military & defense is expected to grow, at a high CAGR between 2016 and 2022. The 3D imaging technology is used in the defense and military sector at a considerable rate. The head-mounted displays (HMD) are widely used by this sector at a high rate. HMD is used to track the movement of the opponent; it is helpful in recognizing and identifying their exact location. This technology is also used in military vehicles along with its other solutions such as 3D navigation system, 3D multi display, 3D radar, and reality screen. Moreover, a 3D-radar system is useful for applications such as detection of landmines, weapons, and explosives owing to its high-resolution imaging capabilities. Volumetric 3D displays often play an important role in the military application. It is used to demonstrate various classified activities such as virtual war field to demonstrate the functionality of any particular weapon or devices. In terms of region, Asia-Pacific is expected to witness high growth of this market between 2016 and 2022. 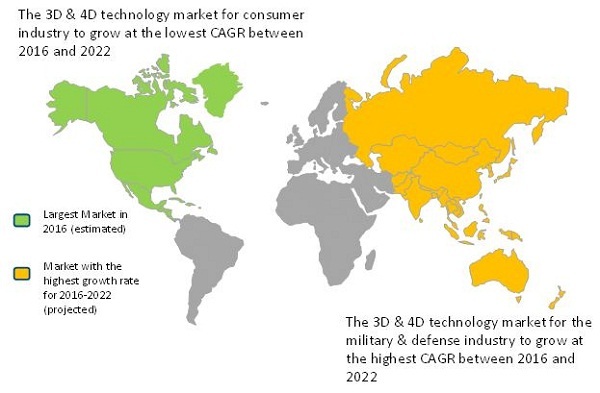 The APAC region is the fastest-growing market for 3D technology, and it is likely to hold a tremendous market potential for 3D applications in the near future. Major countries which have a huge potential for 3D technology applications in the APAC region are developing economies such as India and China. Another major market for 3D technology in the APAC region is Japan. Some of the major drivers which are responsible for spurring the demand for 3D technology in the APAC region includes rising income levels, lifestyle changes, and need for faster manufacturing technology. Among technologies for 3D & 4D Technology market, 3D input devices such as 3D cameras, 3D scanners, 3D sensors and 3D imaging solutions are expected to grow at the highest CAGR between 2016 and 2022. Increased demand for 3D printers and rising demand for faster quality check and inspection methods are the major factors which are driving the growth of the 3D input device market. Major factors which are driving the 3D imaging solution market are the increase in demand for 3D content, improvement in 3D acquisition devices, and high availability of 3D display devices. However, non-standard delivery format and output devices restrict the growth of the 3D technology in the entertainment industry. The 3D & 4D Technology market is segmented into four technologies and there are many players involved in this market for different technology. For 3D applications, Vicon Motion Capture System (U.K.) among the profiled company leads the market. Google (U.S.) and Startasys (U.S.) are top revenue generating companies in the 3D output devices. FARO Technologies (U.S.) leads the market for 3D input devices, and Autodesk (U.S.) is the forerunner for the 3D imaging solutions market.